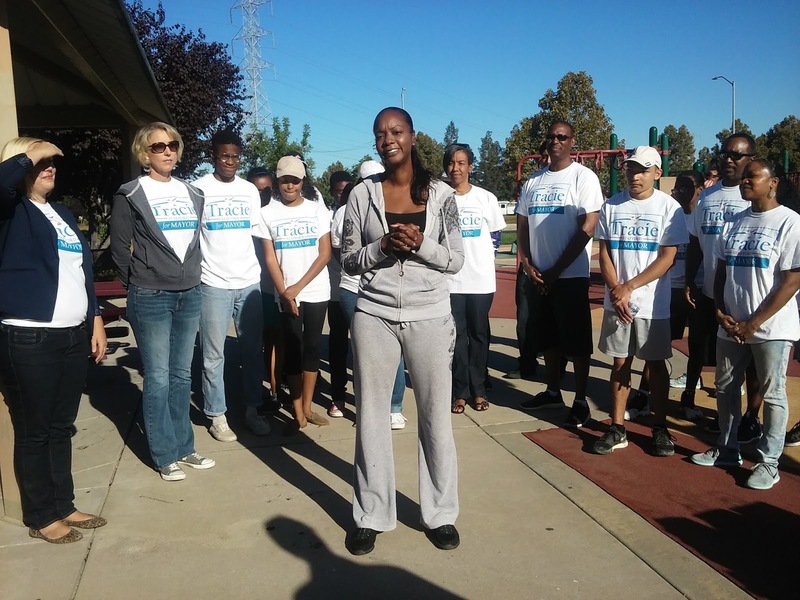 As one of the seven candidates vying to become Elk Grove's next Mayor, what Tracie Stafford lacks in financial resources compared to the campaign's leading fundraiser, is more than made up in determination and enthusiasm. These traits were on display Saturday morning as Stafford spoke to supporters and campaign volunteers as she kicked-off her campaign. The event, which was held at Lewis Park, drew about three dozen supporters who rallied for the novice politician and conducted a precinct walk in Elk Grove. Introducing the candidate was supporter Jennifer Teykaerts who said she become aware of Stafford because of her advocacy work on behalf of domestic and sexual abuse victims. "When I got to know Tracie a little bit better there is even more to her than that," Teykaerts said. "There really is no one single box that Tracie Stafford fits into, and that's what I particularly like about her." Teykaerts added, "She is not working for the system, she is not working for herself, she is working for you." Addressing her supporters, Stafford said she is not part "that political machine" and, therefore, is dependent on the community to support her campaign. Stafford went on to say that like many other people, she and her family moved to Elk Grove seeking a better quality of life. She noted that there is an over emphasis on enlarging the city rather than focusing on maintaining and improving quality of life issues for existing residents. "The town has grown into a city, however, it is still being run like it is a town," she said. "We need someone in office who is able to see beyond the town." On Thursday Stafford learned that Planned Parenthood had endorsed her candidacy. The endorsement letter stated she won their approval "based on your stated and proven commitment to our mission and your 100% score on our 2016 General Candidate Questionnaire." Earlier in the month Stafford beat Democrat Elk Grove Vice Mayor Steve Ly in votes from fellow party member of the Elk Grove-South County Democratic Club. Although Stafford earned more votes than Ly, no candidate met the 50-percent threshold to win the club's endorsement. Stafford also unveiled a slight addition to her campaign material to signify her determination. That symbol is a hummingbird. "They are small, they are unassuming, they are powerful, they are versatile, and they will fight for what is right," she said.